Why did World War 1 become static trench warfare? 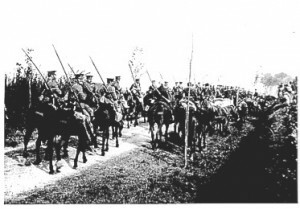 The abiding image of World War 1 is of two sides in deadlock, facing each other across no man’s land. It is of soldiers dug into opposing lines of trenches, from which they launched repeated attacks resulting in very little gain and massive casualties. There is much truth in this image but, like all popular images, the reality was more complicated. When war broke out in 1914 neither side imagined a war fought in trenches and lasting several years. The Germans planned a war in which their armies would sweep through Belgium and Northern France and defeat the French armies within a matter of weeks. Germany would then be free to transfer its troops to the East to defeat Russia. This was the famous Schlieffen Plan. France planned to launch an invasion across the German border into Alsace Lorraine; the so called Plan 17. In Britain it was popularly believed that the war would be over by Christmas 1914. The First World War was not always deadlocked in trench warfare. The opening months of The First World War were not fought in trenches, rather it was a war of movement and manoeuvre, as were the closing months of 1918. Nor was the war fought in trenches away from the Western Front in Europe. The war in the East, fought between Germany and her ally Austria against Russia, was never a war of trenches and deadlock; this is also true of the fighting between Britain and Turkey in the Middle East. each side knew it had to win here or lose the war. If this situation was not planned for, why did it arise? One reason for the deadlock was that the technical development of weapons gave a massive advantage to defenders. The development of bolt action, breach loading rifles greatly increased the fire power of infantry; a regular British soldier in 1914 was trained to fire 15 rounds per minute. Machine guns created a hail of bullets to pour into the ranks of attacking infantry. The German MG08 machine gun could fire 400 rounds per minute and had an effective range of over 2000 yards. Above all, attackers moving in the open were exposed to artillery fire. By 1914, the effectiveness of shells, and the rate of fire and accuracy of artillery had increased greatly. Troops concentrating in front lines in preparation for an attack were obvious targets for artillery, and attackers crossing no-man’s land often had to pass through a wall of high explosive and shrapnel. As the war progressed, the power of the artillery increased enormously. To gain protection from these weapons both sides went underground, into trenches, dug outs, bunkers and tunnels. Another explanation of the deadlock is that trench systems were not simply ditches dug into the ground. Trench systems became fortresses of multiple trenches, fortified villages, concrete bunkers, underground dugouts and belts of barbed wire. This was particularly true of the German system. With the two notable exceptions of The Second Battle of Ypres in 1915 and The Battle of Verdun in 1916, the Germans sat on the defensive in France and Belgium between November 1914 and March 1918 in order to concentrate efforts against Russia in the East. They created multiple systems of defence, often miles wide. For infantry, the prospect of attacking these positions across shell torn ground in the face of machine gun fire and a wall of exploding shells, was an enormously daunting prospect which frequently led to high numbers of casualties. One of the most basic reasons why it was impossible to break the deadlock on the Western Front was the inability of commanders to control events once an attack began. Telephone lines from the front line were regularly cut by shellfire and runners were routinely wounded or killed. Various kinds of visual signals were used and aircraft provided aerial observation but, without a system of portable radio, getting information back to commanders was slow and unreliable. Commanders prepared meticulous plans of attack, but once a battle began events moved beyond their immediate control and they often had little idea of what was actually happening. Generals dreamed of ending the deadlock, breaking through the enemy trench lines and creating a war of movement in the countryside beyond. There were a number of occasions where attacks went well initially and where attackers captured the enemy’s first system of trenches, but success ended here. Commanders were not aware of where and when attacks had gone well or of where they had failed and were not able to move reserve troops forward to the right place at the right time. On the other hand, defenders found it much easier to fall back to another trench line, create new lines of defences and plug gaps in their lines with reserve troops. Contrary to popular myth, many senior commanders were killed as a result of going forward in an attempt to gain information and control events. Another basic explanation of the deadlock was the fact that both sides were evenly matched and could call on a seemingly endless reserve of men and supplies. This was the first war in history in which modern industrial powers fought each other. Each side mobilised populations numbering tens of millions and produced previously undreamed of quantities of weapons and supplies which constantly replenished the losses suffered on the Western Front. The war became one of attrition (wearing out) in which the loser would be the side which could no longer find the young men to draft into the army to replace casualties or maintain production at home. Ultimately, it was Germany’s inability to continue to do this which decided the outcome of the war. Germany’s industrial capacity and supply of essentials, such as food, was slowly strangled by the British naval blockade. The arrival of American troops in 1918 further tipped the balance against Germany. However, there was no rapid breakthrough or collapse. Germany was driven back towards its borders from the summer of 1918, but this was a costly process involving assaults against successive lines of defence. History generally remembers the slaughter at Verdun, on the Somme and at Passchendaele, but some of the most costly battles were those occurring in the final months of fighting.